Obama, doubling down on immigration? No. No! A blackjack table. Looks like the middle player doubled down. President Obama is going to announce his executive-order overhaul of immigration enforcement policy tomorrow night, then speak about the plan during a Friday “rally” at a Las Vegas high school. The blackjack-derived phrase “double down” is used frequently by journalists, including political journalists, to describe the behavior of a leader who sticks with a course of action even when others doubt the wisdom of that course of action. Many observers, including some who generally support Obama, have been critical of the immigration plan he’s expected to announce, arguing that acting unilaterally on such a major issue through executive action—rather than through collaboration with Congress—would set a damaging, autocratic precedent. 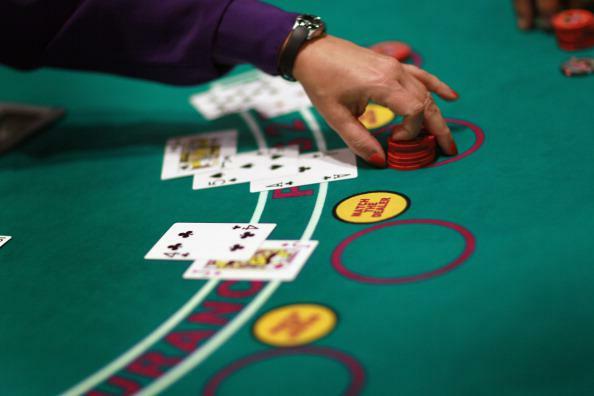 The game of blackjack is played at many casinos in Las Vegas. Many writers will be tempted to say that Obama is “doubling down” on his immigration plan when he speaks about it in Las Vegas. In punditry, sounding savvy, cutting-edge, and with it is often rewarded more than being right. Hence “double down.” Hence the terms “triangulation” and “triangulator” to describe concepts that are also conveyed by the old-fashioned words “compromise” and “moderate.” And after a term is used enough times, even people who realize it’s being used incorrectly or unnecessarily tend to just give up and go with the flow and use it that way too. The objections of picky language-whiners will be irrelevant, and uses of “double down” will fill America’s headlines and news stories this weekend like so many chips filling the hands of a Las Vegas blackjack winner who has smartly doubled down on promising cards. Thus is our language—nay, our very being, because what sets humankind apart from the beasts of forest and field if not language?—debased.